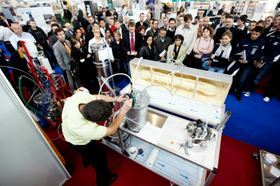 COMPOSITES EUROPE is held annually in Germany. If your company is exhibiting at the COMPOSITES EUROPE trade show on 14-16 September in Essen and you would like to be included in our editorial preview feature, please send us a press release or a summary of what your company will be highlighting at the exhibition, concentrating on any new developments, plus any relevant pictures. Please send your information to us at RP@elsevier.com by 6 August 2010. Reinforced Plastics is the official media sponsor of COMPOSITES EUROPE. The Reinforced Plastics COMPOSITES EUROPE preview will be published in the September/October issue of the magazine and on our website prior to the event. It will also be distributed from our exhibition stand during the show. Inclusion in this editorial feature is free of charge. Additional promotional activities are available: please contact our sales team. Gurit plans to open a wind blade mold production facility in Szczecin, Poland. Technical Fibre Products says that it will be showcasing its Tecnofire range of fire protection materials at Composites Europe.